On February 27, over 1000 people gathered at the University of Central Florida to meet a special little boy and witness something extraordinary at the same time. Alex Pring, a disabled six-year-old from Groveland, Florida, was all-smiles when he high-fived people using his new prosthetic arm. What’s different about his new arm was that it was completely made from 3D printing. A group of students from the university formed a plan to create what was probably the longest high-five chain ever recorded. Even though the plan’s organizers claimed that the entire thing fell short, they did manage to achieve an even bigger goal – To help raise awareness for a non-profit organization called Limitless Solutions. This organization consists of several UCF students who built the 3D printer and made Alex’s prosthetic arms. And now, Alex can enjoy a new life all thanks to the university’s hard work. In America, over 1,500 children are born without having fully developed arms. Alex was one of those unfortunate children, but now he can enjoy his new and affordable 3D-printed prosthetic arm. He even has an adorable wish once he receives his new arm – To be able to high five 106 people. 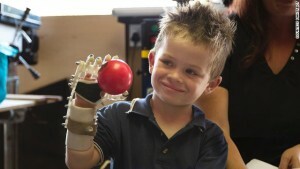 Aside from Alex, there are other children who have received their own set of 3D-printed arms. And they have even expressed their creativity by creating their own custom sleeves to slip their new arms into. For example, one has designed a theme inspired by the hit animated movie ‘Frozen’. 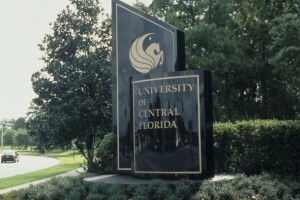 A team from the University of Central Florida is the one to thank for giving children these prosthetic arms: They want to create 3D-printed prosthetic arms and legs that are cheaper than prosthetics made from other materials. One arm or leg costs around $300, and $100 to replace or fix them as the child grows. 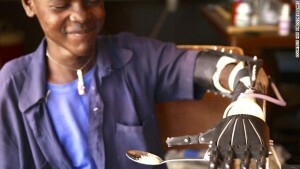 This is a better alternative to the other types of prosthetic arms or legs that cost thousands of dollars. Several electrodes that connect to the remaining part of a person’s upper arm control these prosthetics. When this person contracts their muscles while wearing their arm, tiny pulses of electricity pass through these electrodes, which can start a motor that pulls in the prosthetic hand’s fingers. The hand is then relaxed by another second pulse. Not only is this type of action simple, it’s also easy to control. Children that have new 3D-printed arms are now using them to write, carry books to school, and even play tag.